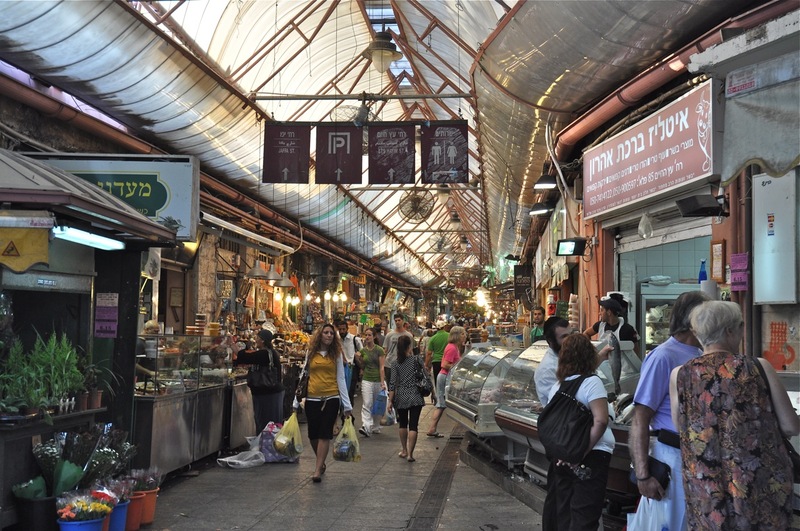 You can tell a lot about a city by whether it has an outdoor market and Jerusalem has a great market. 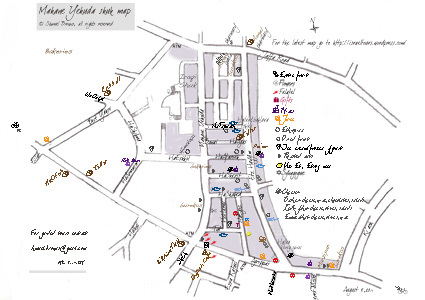 In 1982 for a book called “Israel Sprouts: A Vegetarian Guidebook (to Israel)” I drew a map of Mahane Yehuda to help people find their way around. 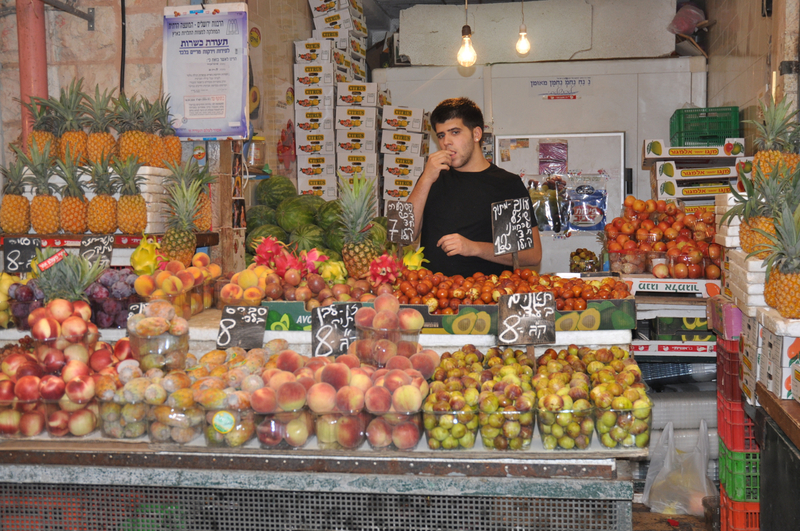 I scanned that map and added a lot of new information so that it better reflects Mahane Yehuda today – it’s not just a fruit and vegetable market with shops selling dried goods. It has gentrified and there are restaurants and cafes, designer clothes shops, health food stores, artisan bakeries, shops that sell imported cheeses, fine wines, chocolates, halva. In the 5 years that the map has been on my website, it has been viewed more than 6,000 times. The map is © Shmuel Browns, you are free to use it for personal, non-commercial use as long as you do not modify it. If you have corrections or suggestions please contact me by email. To help organize the information I’ve separated the information into 3 maps and color coded them, one for restaurants, one for gifts and one for food shopping. To get your FREE copy of the latest maps I’d appreciate it if you would subscribe by entering your email address in the right hand column under FOLLOW BLOG – then just send an email to mahane.yehuda.map at gmail dot com. With these maps in hand you’re ready to head out to explore the shuk on your own or contact me for an insider’s guided tour of Mahane Yehuda. Have fun exploring the shuq. Mid-morning and you went out without breakfast – check out the health food stores on Agrippas Street, buy some fresh fruit, like pineapple, star fruit, kiwis, mangos; try a bureka, a filo pastry with cheese and/or spinach. Want organic? 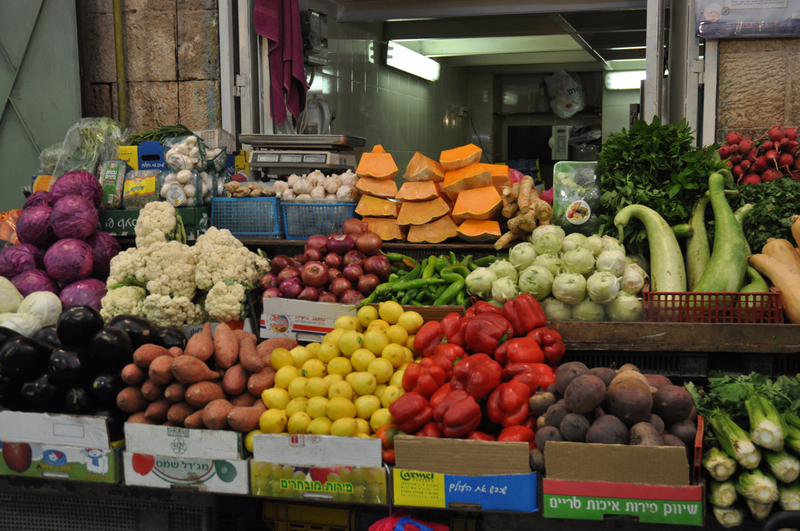 There is organic produce and products at TevaNet on Agrippas and an organic restaurant on #1 Agas Street, note that Agas is called Banai at Mahane Yehuda Street. Picnic? Head for one of the stores like Basher or Zedkiyahu and pick up an assortment of cheeses & salads. Get artisan breads at Teller. Wine? Fruit for desert. Walk down Agrippas Street (west, away from town) to the park, Gan Sacher. Snack – felafel (in our family, the favorite is the brothers Levi on the corner of Mahane Yehuda and Agrippas Street). For hummus try Rachmo, Agas 1 or Azura. Feel like eating something else – Ichikadana is a vegetarian Indian restaurant on HaEshkol Street, Topolino is a cozy, Italian restaurant, both are family run. Looking for a present for loved ones back home – check out handicrafts at Roza, pottery at Pri HaAdama, Moroccan crafts at Rika. This entry was posted in Food, Jerusalem and tagged cheese, etrog, felafel, flowers, fresh juice, fresh-squeezed, gifts, guided tour, hummus, ice cream, orange juice, pomegranate, restaurants, roasted nuts, shuk, shuq, synagogue, tour, walking tour, Wine on May 31, 2008 by Shmuel Browns.